Bookvip - A LOT OF BROKEN PROMISES! Customer satisfaction is the mainstay of BookVIP’s business and all customer information is encrypted and never saved after processing. 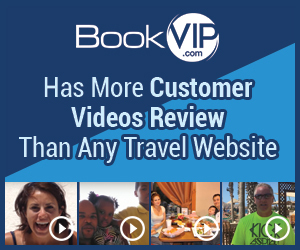 As the booking company, BookVIP’s website advertises the rooms as advised by the participating resort partner and the rooms are assigned by the resort based upon availability. We will take up the discrepancy regarding your airport pick-up with the resort partner and do regret that they were not there to meet you. First off the Resort my wife and I stayed in was amazing , no thanks to bookvip. First off after reservation for trip was scheduled I had to re-confirm with my card info three times. After doing this I continued to check my back account where I notice there were someone had stolen my card number and racked up 1000.00 in charges. Secondly there was no one at airport to pick us up and the king bed was two twins, not good for anniversary. have left multiple messages with no answers. Resort manager even stated they hate to deal with Bookvip because they are tired of cleaning up their messes. Review #884562 is a subjective opinion of cjasemc.